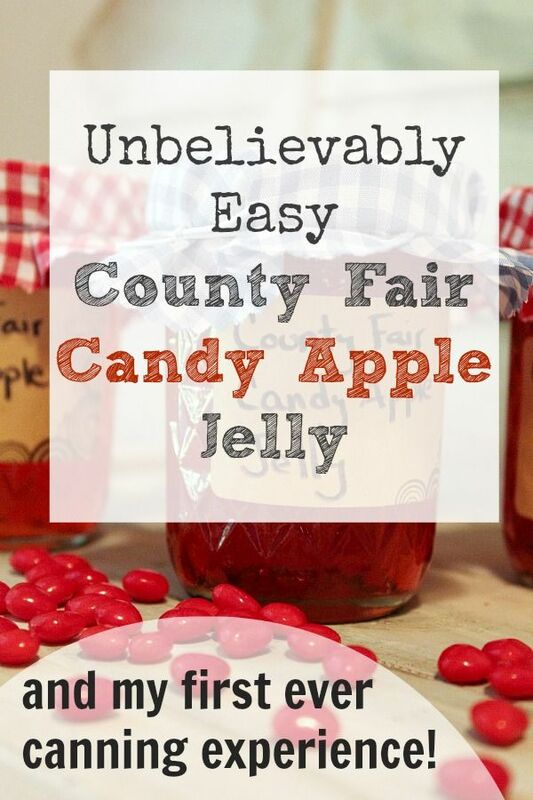 Unbelievably Easy County Fair Candy Apple Jelly and my first experience at canning! I’ve been dying to try out canning for a few years now. It seems so wholesome and self-sufficient and all that, doesn’t it? I recently had the chance to try out a complete Home Canning Starter Kit from Bernardin and now I think I’m hooked. I even discovered a fun recipe perfect for beginners that made me feel like such an old pro at this canning stuff in a matter of minutes! I was so excited to finally fulfil my dream of learning about canning with the help of Bernardin recently! They gave me one of their starter kits to try out and I have to say it was just perfect. It’s everything a beginner needs to get started, but it has all the tools you need to take you through as you learn more and more about canning and get more and more adventurous. Of course I had to come up with a fun recipe to try, even though it was only my first time. I mentioned the idea of this jelly recipe to Kennedy and she was so excited! So that settled it. This is a perfect no mess, no fuss type of jelly for when you’re just getting your feet wet. I also think it’s perfect for this time of year. It has great end-of-Summer-and-into-Fall flavors and now I’ve got a whole batch just waiting to be enjoyed once the weather starts to cool down. In a large saucepan, mix the juice, candies, and pectin. Bring it to a full boil, stirring constantly. Stir in the sugar and bring it back to a boil. Boil for about 2 minutes, stirring constantly. Remove from the heat and ladle into hot sterilized jars, leaving 1/4 inch of head space. Place the new lids on top of your jars and close them up with the metal bands until they’re just finger tight. Process in a boiling water canner for 5 minutes. See how easy that was? I only made 4 jars because I had these really pretty little jars that came with my kit, but I could have probably made 6-8 little jelly jars from this recipe quite easily. I just put the extras in the fridge to enjoy right now. It really only took about 45 minutes including clean up! I can’t believe I waited so long to learn about canning! The kit arrived just like this all together in a big happy box. Really simple, straightforward instructions were included. They really made it seem easier than anything else I’ve read online. Look how happy those ladies are on the front! It can’t be that hard if they’re laughing like that! They also included a whole bunch of goodies for decorating the jars for gifting with my kit. 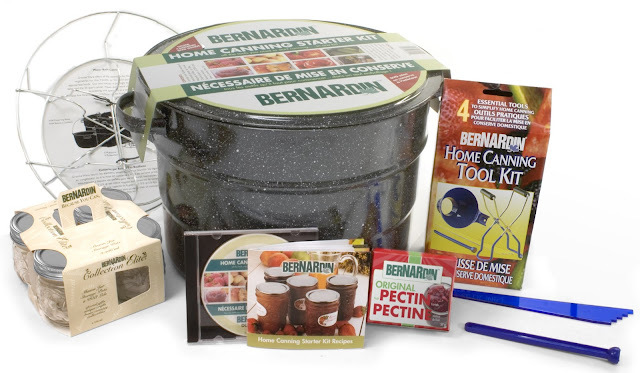 Bernardin will be selling jar decorating kits at Canadian Tire stores in Canada starting in the fall. That’s how I managed to get my jars looking so cute, in case you were wondering. No decorating skills needed! These cute jar labels are included in the kits too! Speaking of jars, here’s a close of up the jars included with the kit. I washed them and then warmed them up in the canner just like it said to in the instructions. Isn’t it a beauty? I thought I was a little strange for being so in love with a big pot, but then Kennedy came home from camp and said “Oooo! Pretty! Did they really give this to you?” So the love of canning must be genetic. I mixed up my simple recipe and got my canning complete in no time flat. Here’s how it looked when it was all done! It really looks like it was done by someone who knows what they’re doing, doesn’t it? That’s the power of having the right tools! Thank you so much to Bernardin for sponsoring this post and for providing me with the kit to help me fulfill all my canning dreams! Make sure you give the recipe a try. It’s a good one! That jelly sounds amazing! Great giveaway too! I’ve always wanted to make my own jelly! Sounds delicious! YUM! I love that simple jelly recipe! If you don’t sterilize the jars, the jelly should be processed 10 mins. Sterilized jars only need 5 mins processing. To sterilize the jars, you need to boil them for 10 mins. and keep hot. That comment didn’t make sense, lol. For jelly being processed 5 mins, the jars need to be sterilized; that is, boiled for 10 mins, then kept hot. If you don’t want to sterilize jars, you can process the jelly for 10 mins. This jelly is beautiful, delicious and smells great! However, none of the jelly jelled! Should I pour the “syrup” back into a pot and recook it? Your brand of pectin-type product is unavailable in the rural area where I live. I’m making this recipe for my church bazaar which is coming up November 7, so I’d love your pointers as soon as possible. Thanks so much. I did use sterilized, hot jars, hot sterilized lids and water bathed for 5 minutes. Thank you for your blog and Jelly recipe. I have been canning since 1972. You will have years of fun and it is hectic at times. Fun!!!! How do you get a sponsor to supply you a product as a blogger? I am interested in starting a blog. Hi Jenny! In this case, the company contacted me and asked if I would be interested in working with them, and that’s usually what happens in most cases. I have reached out to brands myself though if there’s been a product that I really loved that I thought I would like to share with my readers, from time to time. There are also a lot of agencies working to pair brands with bloggers and influencers who would be a good fit for their campaigns and those are a great place to start out!